I had fun converting the Aviriel Tellerion miniature to resemble Alisa Landale from Phantasy Star so, on a whim, I started making another video game inspired conversion. I ran with another classic Sega roleplaying game heroine, Mae the Centaur Knight from Shining Force. 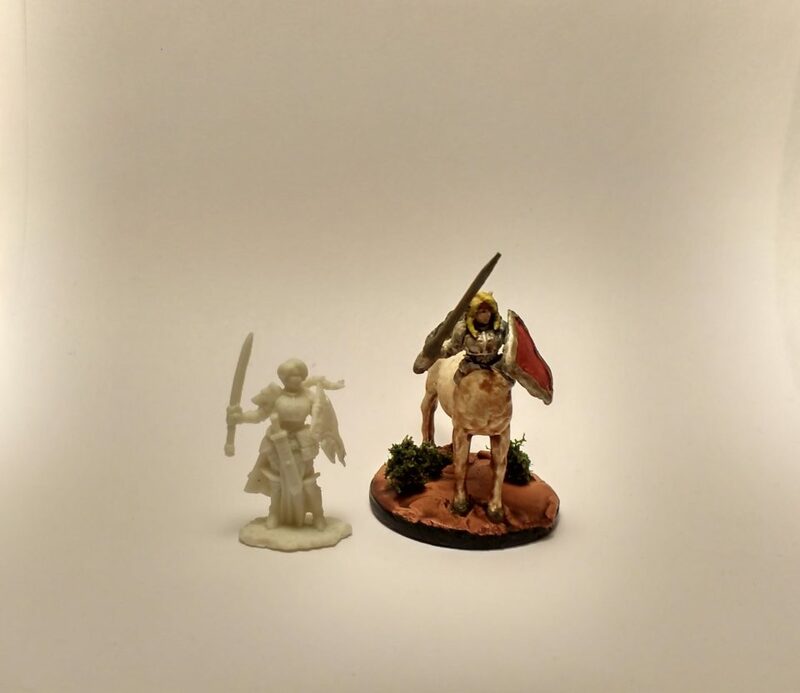 Last year, I had ordered four dozen Mini Plastic Horse Figures from Amazon for my daughter to paint (she wanted to paint with me) and I decided to use one as the base for the centaur. I then searched through my miniatures for one that would be well suited for the humanoid portion and decided on Trista. However, I liked the original miniature so much that I ordered a duplicate to paint later! The hardest part was adding the ears, headband, and hair. The rest of the modifications…despite the shield coming out sloppy…were pretty straightforward. Incidentally, the lance was converted from a spear that came in the Reaper Bones III kickstarter. All in all, it was another fun conversion and I’m pretty happy with it despite the sloppy portions.